A virtual, asynchronous, facilitated coaching program. Last time in the US in 2014. Workshops in Switzerland, Austria, India, Singapore, and Hong Kong. Is training the best solution? I am a great believer in walking the talk. So I wanted to use a textra game to teach about textra games. Here's the result. To recall basic information about textra games. Distribute the handout to all the participants. Tell the participants that there will be a quiz on the contents of the handout and encourage them to read it carefully. Suggest that they should take notes, underline key words, memorize important facts, and make up their own questions. Announce a 5-minute time limit and start the timer. Assign pages. Ask each partner to toss a coin. The winner owns the first page of the handout, and the other participant owns the second page. Ask one partner to hold up the handout so that each of the two pages faces the partner who owns the page. Each partner also takes an index card to keep track of the points earned by the other person. Begin grilling. Ask partners to take turns asking questions about the content on their page of the handout. The other player gives an immediate answer. If the answer is correct, the questioner makes a mark on the scorecard to award a point to the other player. If the other player gives an incorrect answer or does not answer at all, the questioner shows the relevant part of the handout to give the correct answer. Continue playing. Monitor the group as they take turns asking and answering questions. Encourage the partners to match the nature of the question and its difficulty level. For example, if one partner asks a difficult question with a two-part answer, the other partner should ask a similar question from his or her page of the handout. Conclude this round. Blow the whistle after 3 to 5 minutes. Ask the partners to add up the points awarded to other player, write the total score on the index card, circle it, initial it, and give it to the other player. Review the handout again. Explain that participants will have an opportunity to ask questions from the other pages. Suggest that they review the handout to get ready for the second round. Give the participants a 3-minute time limit. Repeat the grilling procedure. Ask the partners to use the same procedure as before for asking questions, answering, and scoring points. Suggest that the partners exchange their scorecards and use the other side for keeping track of the points for this round. At the end of a suitable time period, ask the partners to complete their scorecards. Organize the participants into two or more teams. Each “team” should have at least one member and up to seven. Picture this: You are the manager of a product development team for TLA, Inc. You and your team are responsible for launching a new database system in time for E3—the big, big electronics show. You have several team members. Some are ace performers, others… not so much. As you progress through the development process, you have to coach these team members through various situations. You also must deal with difficult peers and a sometimes-overbearing boss. Welcome to the course. You will meet Vijay, your best engineer and brightest employee—or, so you think. Bob… well, what is there to say about Bob? He has a pretty severe gap when it comes to recognizing his own skills and abilities. A headache in the making. 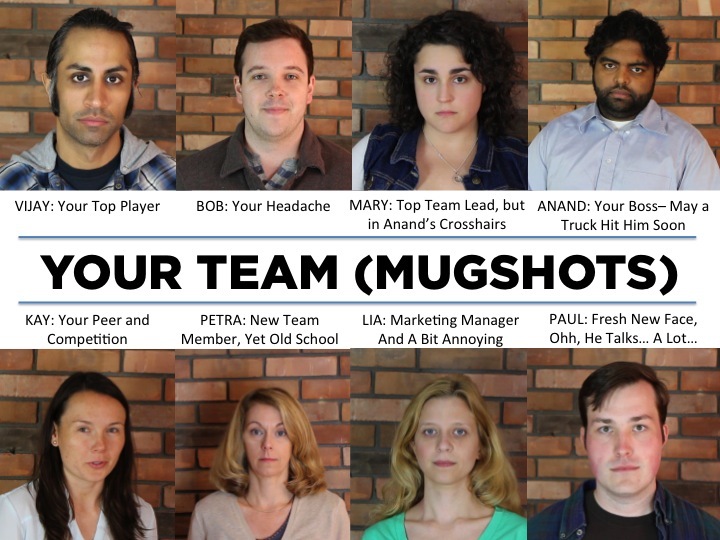 Mary is a terrific team lead, but your boss, Anand (with his own insecurities) is causing havoc by bypassing you and going to her directly. Petra is new, serious, older, and not quite fitting in. Paul is a great person, just out of college. Earnest and talkative… have we mentioned talkative? Petra may just kill him soon. Your job is to interact and coach all these team members. You will also have to manage up and across, providing coaching and feedback to your colleagues and your boss. Can you do it? Coaching for Performance (CFP) is a Thiagi Group online public workshop. It adapts our flexible 4-Door elearning approach. Participants will access a special website that hosts all of the content and allows for interactivity among students, facilitator, and the cast of characters. Participants will review the overall context of the simulation. They will have access to 3-minute video character profiles. Each profile provides background information about a character and bits of information about the overarching story. In the Library , participants access job aids, tools, and checklists for preparing, delivering, and following-up a coaching conversation. There are over 20 specific practical tools in the library. All tools are provided as downloadable PDFs and many have additional screencast, video, and podcast support to provide deeper understanding. In the Mission Control , participants are assigned missions where they are given specific scenarios and asked to provide appropriate responses. For example, Bob has consistently misapplied important code-naming conventions. He is oblivious to this fact. The participant will have to identify a strategy for approaching Bob, and then execute parts of that strategy using video responses. After each participant submits a response to each mission, the Facilitator (Matt Richter, President of the Thiagi Group) provides feedback through video. Each character has been acted by a professional actor and captured on video, thus putting a face to the different team members. At the end of the eight missions, participants step out of the simulation to complete the final performance test. They go out in the real world and conduct a coaching conversation with a real-life team member. We offer three different formats for this test to accommodate unique situations participants may have. The course goes live June 16, 2014 and closes July 15, 2014. Participants can engage at their own pace during that period. Normally, the course will cost $499, but for this first outing, we are only charging $125. Space for this initial launch is limited to 20 participants, so register today! The game presents a question (or a clue) and a series of dashes representing the answer. Tap a letter or number if you think it's in the answer. (If you have a machine with a keyboard, you can tap the yellow box and enter your guesses there.) If you make a correct guess, every occurrence of that letter (or number) will appear in the answer and you'll hear a pleasant sound. If you guess wrong, you'll hear an unpleasant sound, and one piece of pizza will disappear. You lose if you run out of pizza (that is, if you make six incorrect guesses). This month's game requires you to recall seven different types of training activities that are frequently featured in TGL . Please try the game out at http://thiagi.com/p632spring2014/tgl-2014-06/ and come back and tell us what you think by using the comments link below. Here is Thiagi's upcoming workshop in Washington, DC / Arlington, VA. This will probably be the last public workshop we organize in the USA this year. Discount: TGL readers can register for the workshop at the discounted rate of $949 (a savings of $150 from the regular rate of $1099). Scholarships: A few scholarships are available for this workshop. Write to thiagi@thiagi.com for details. After training, organize follow-up coaching sessions in which the participants pair up and support each other. While training, ask open questions. Give appropriate feedback through sample answers or lists of key points. Is your glass half full? Sometimes it's difficult to see what's positive about a situation. Yet looking for the positive, especially when it's least likely, actually creates new opportunities. Explore why an optimistic approach is in your best interest. Power Tip: Look for signs of growth. Whether plants or people, change is often incremental. Read more in the May 2014 issue of Firefly News Flash : http://www.thefirefly.org/Firefly/html/News%20Flash/2014/May%202014.htm . In our previous issue, we talked about the serious elearning manifesto ( http://elearningmanifesto.org/ ) issued by four thought leaders in the field of elearning (Michael Allen, Clark Quinn, Julie Dirksen, and Will Thalheimer). As one of our survey respondents pointed out, the characteristics of effective (“serious”) elearning are also true of any kind of learning. Do Not Assume that Learning is the Solution. We do not assume that a learning intervention is always the best means to helping people perform better. Are you incorporating this principle in your training? Think back on the last training you provided. Have you ever seen an example of serious elearning that features all eight elements identified in the table? Eighteen readers responded. All but two of said they had not seen an example of serious elearning that featured all the required elements. Ideal vs. actual. Lots of tensions to be managed. I don't think this should be a question of A or B. It should be A and B. We must have eLearning that is both content focused and performance focused. It should be efficient for authors and meaningful for learners. Serious elearning can be more powerful for learners. It will also take more time for designers not used to serious elearning to adapt their style to develop this better form. Years ago (maybe 2003), I took a course from Dr. Will Thalheimer called Leveraging eLearning. He walks the talk! These requirements could be true of any effective learning. They are not limited to elearning. This survey is still open. Please visit last month's issue for background information about the manifesto and the link you can use to respond. Subscription learning is an exciting new training technique. To learn more about subscription learning, its importance, and what is happening in the field, check out the website curated by Will Thalheimer, http://www.subscriptionlearning.com/ .